STURBRIDGE CLOSE AND COUNTRY QUIET! Leave the hustle & bustle of the real world behind. Relax with us & enjoy fresh air, spacious sites, quality family time & starry nights around the campfire. One visit here & you'll make our wooded preserve your second home! We are new "seasonal " campers. Finding Oak Haven was the best find ever! Being we were all new to this we really needed some assistance. The kind and friendly staff here went over and above helping us with finding a site, setting up and giving us pointers thru the season. This campground is clean and beautiful. There is a great family atmosphere here. The rest rooms are very clean and well taken care of. Lots of activities for the children and fun events for adults! 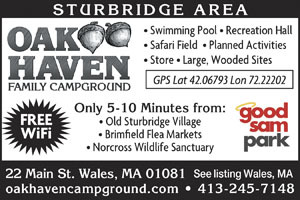 We recommend this campground to everyone! Our only complaint is the season just isn't long enough! But that certainly isn't anyone's fault. Nice park, but above all, the customer service is over the top! While there, half thru our scheduled week I had some health issues and ended in a Boston hospital for 7 days and well beyond our original 6 day reservation here. The owners went out of their way to help my wife by extending our stay on the Labor day weekend even though they were booked. The owner even offered to help hook the toad, load the motorcycle, move the coach (if needed), and pack up while I was recuperating when the time came to actually leave. We did not use restrooms or other facilities but I assume they were in order based on the general appearance of the grounds. Nice helpful people that run the park. Not much to do in the park (unless you are a kid) and there is not much to see close to the site. The park and restrooms were well maintained. Positives: It is a very scenic area with New England charm. 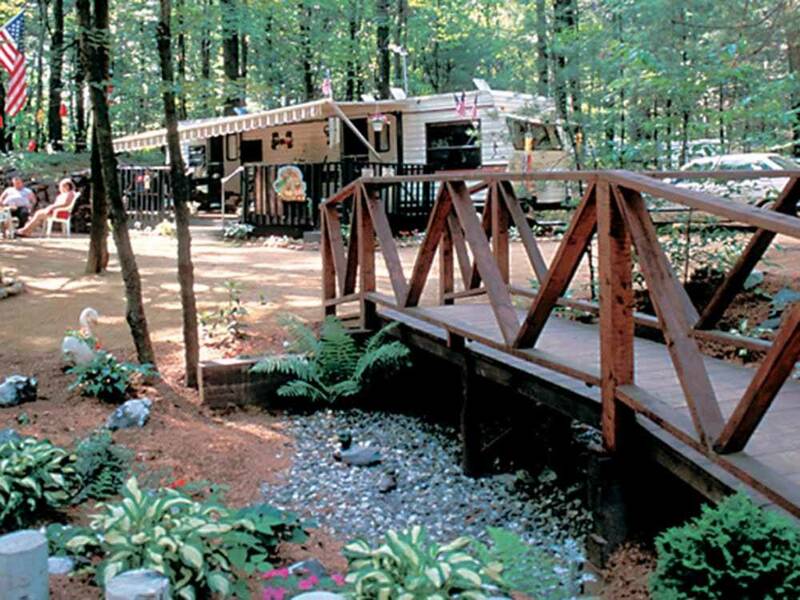 The park is well maintained and has a small family campground feel to it. The bathrooms were a little old but were very clean. The staff was friendly and were very accomodating with us when we came in late at night after a rough day on the road. Prices were very reasonable. Negatives: The campsite was difficult to get on in the dark, they could greatly improve their park if they added more lights. The lack of 50amp service and sewer hookups at our site was a bit disappointing for a campground in this day and age. However, that is just our opinion they do not advertise that they have these things at all of their sites and are very clear when we called that they do not. Overall: We enjoyed our stay at Oak Haven. It was very much out of our way and after road closures we were forced to change plans last minute. They could not have been more helpful and accomodating. When in New England we do not normally stay in this area of the state but after our experience we would specifically come back to stay with them again. They do not have all the bells and whistles of a resort or larger park but sometimes it is a pleasant change.